From Goodreads ~ A serial killer is on the loose in Beantown and the cops can't catch him. But when the killer leaves his red rose calling card for Spenser's own Susan Silverman, he gets all the attention that Spenser and Hawk can give. Spenser plays against time while he tracks the Red Rose killer from Boston's Combat Zone to the suburbs. His trap is both daring and brave and gives the story a satisfying climax. Spenser is a private detective in Boston. Two of his cop friends come to him for help find a serial killer who is targeting black women and leaving a red rose, hence the nickname the "Red Rose Killer". Spenser can do things that the cops can't. Plus one of the cop friends received a letter from the killer claiming to be a cop so none can be trusted right now. When the killer leaves a rose for Susan, Spenser's long time love interest, it gets personal and Spenser assumes the killer is one of Susan's clients (too much of a coincidence for me). 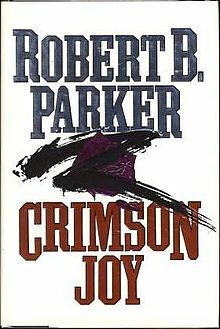 We find out who the serial killer is about three-quarters of the way in and the remainder of the book is Spenser trying to trap him without getting Susan killed in the process. This is the fifteenth in the Spenser series (there are currently 46, with the last six written by Ace Atkins after Parker's death in 2010). I've read many over the years (and have liked the series) and have started reading them from the beginning of the series. Though it is part of a series, for the most part it works as a stand alone. I liked the writing style ... I found it humorous at times. Spenser is a tough guy with a wisecracking sense of humour. For the most part, it's written in first person perspective in Spenser's voice, which has been the norm for all the Spenser stories. In this one, it's also in first person perspective in the killer's voice. As a head's up, there is swearing. I haven't been a fan of Susan since Valediction and Catskill Eagle (the eleventh and twelfth in the series). That's when I started disliking her and finding her annoying ... she has become picky and princessy. Though Spenser and Susan have been together for about 15 years, in this book they talked like teenagers about their relationship, which I don't find realistic given their age and how long they've been together ... "I love you." "I love you." "I love you more." "No, I love you more." "I can't imagine my life without you." "I can't imagine MY life without YOU."